Before we procede to explain the Public appearance of the Pillar of fire in June of 1933 to give Brother Branham his 'second commission', let's briefly lay a Scriptural foundation to show that God has in Scripture, Publicly (visibly and audibly) revealed Himself to the sight and hearing of man. It is not unusual that God would in various ways, manifest His Presence publicly for the people to see. The Bible contains numerous accounts of public appearances of God, vindicating His Prophets or just to confirm His Presence with the people. Believing that God is "The same yesterday, today and forever", (Malachi 3:6; Hebrews 13:8) then WHY should we think it strange for God to publicly appear before the people in the Twentieth Century to vindicate His Prophet to the Gentiles, and also to confirm His Presence with us according to Luke 17:30? Since the beginning of time God has publicly shown Himself to man in different forms and ways. In Creation he was identified as "Spirit", even the Holy Spirit speaking forth the thoughts of God. John in chapter one of his Gospel said, "In the beginning was the Word (Logos), and the Word (Logos) was with God, and the Word (Logos) was God.....In Him was Life and the Life was the LIGHT of Men." When the Word (Logos) was made flesh He said, "I AM the LIGHT of the world". Again it is written, "God is LIGHT and in Him is no darkness at all." It is written in the book of Genesis that God came down in the cool of the day to fellowship with Adam and Eve. We are not told what form God was revealed in BUT we are told that He was there in a form that could be seen and heard (Genesis 4:8). In the Progressive self-Revelation of Himself in His Word, we learn that God appeared as a "Burning Lamp", (LIGHT) to Abraham, passing between the pieces of Abraham's sacrifices (Genesis 15:17). To Moses, God appeared as a "Pillar of Fire" in the bush that was not consumed. From henceforth, the "Pillar of fire" would become a manifestation of the "attribute of the Fullness of God", vindicating His Prophet(s) and His Presence with the people. In the Book of Exodus it is recorded that God, was revealed in the form of the "Pillar of Fire", by night and "A cloud", by day, leading the Israelites through the wilderness (Exodus 13:21-22). This manifestation was there for all to see. They didn't have to take Moses Word for it - All saw it. In Exodus 14:19-20 when Israel was seemingly trapped on the shores of the Red Sea, the "Pillar of Fire" moved between the Camp of Israel and the Egyptian Army. All that night the "Pillar of Fire" gave Light to the Israelites, and it was a "cloud and darkness" to the Egyptians. Even so, today, the manifestation of the "Pillar of Fire" in this Age is Light (Revelation) for the True Believer to walk by, BUT it is a "cloud and darkness" to the make-believer and unbeliever. 33:7 And Moses took the tabernacle, and pitched it without the camp, afar off from the camp, and called it the Tabernacle of the congregation. And it came to pass, [that] every one which sought the LORD went out unto the tabernacle of the congregation, which [was] without the camp. 33:8 And it came to pass, when Moses went out unto the tabernacle, [that] all the people rose up, and stood every man [at] his tent door, and looked after Moses, until he was gone into the tabernacle. 33:9 And it came to pass, as Moses entered into the tabernacle, the cloudy pillar descended, and stood [at] the door of the tabernacle, and [the LORD] talked with Moses. 33:10 And all the people "saw" the cloudy pillar stand [at] the tabernacle door: and all the people rose up and worshipped, every man [in] his tent door. 33:11 And the LORD spake unto Moses face to face, as a man speaketh unto his friend. And he turned again into the camp: but his servant Joshua, the son of Nun, a young man, departed not out of the tabernacle. The People stood in fear and worshipped. Let God come down in the form of the "Cloudy Pillar" today and show Himself Publicly before People, even allow science to take a picture of Him, and the people just brush it off as fanaticism, a cult or a false prophet. Such is the unbelief of this Age, insomuch that Jesus said, "When the Son of man comes, will He find faith on the earth?" WHY is that so? Because the people are more "tuned in" to the church (denominational and non-denominational alike) than they are to the Word of God. They "Hear" the Voice of the Church BUT they can't "Hear" the Voice of the Word speaking in this Age. If "That Voice" doesn't speak according to the Voice of "Traditional Christianity" then the majority of the people refuse to "hear" what the Voice is saying - no matter what God would do to vindicate that Voice, THEY WILL NOT Believe - tho one rose from the dead THEY WILL NOT Believe. In the New Testament when Jesus Christ revealed Himself to Paul (on the Road to Damascus), He was a 'blinding Light', a "Pillar of Fire". Paul, recognizing the "attribute of the Fullness of God", cried out, "WHO are you, Lord?" The "VOICE" spoke back saying, "I Am Jesus, whom you PERSECUTE". Therefore, the True Believers were not stumbled in this Age when God Revealed Himself in the form of a Pillar of Fire to vindicate His servant, the Prophet and to confirm that He had come down to intrepret His Word by bringing It to pass. The unbeliever and the make-believer continues to stumble over what God has done. MOST WILL NOT accept any sign or voice unless it speaks the same as that of "Traditional Christianity", failing to realize the absolute possibility that much of what "Traditional Christianity" taught over the years has been wrong and God winked at it till this Age (Acts 17:30) . Off course most are persuaded that if the "Voice of the Sign" doesn't say what 'traditional Christianity' says then 'the Voice' is a false prophet. The Pharisees and Sadducees in Jesus' day felt the same way. But in spite of the unbelief of the people, God, by His Grace has shown Himself publicly to this generation. The First public appearance of the Pillar of Fire in this Age was on April the 6th 1909, in a little log cabin, when a young woman gave birth to a boy destined to fulfill the ministry of a prophet. Only a few were present at this event to witness the appearance of the Pillar of Fire as It came in through a window opening in the cabin, moved along the wall and stopped over the baby. That baby was named William Marrion Branham. The Second Public Appearance of the Pillar of Fire was on June 11, 1933. 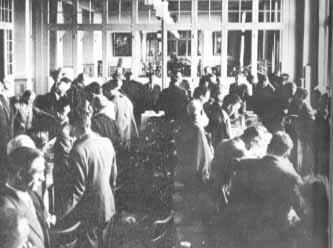 The location was on the shores of the Ohio River, in Jeffersonville, Indiana. The circumstances surrounding this appearance was an Open-Air Gospel meeting which was concluded with a Water Baptismal service. Approximately 4000 people had gathered for this service. 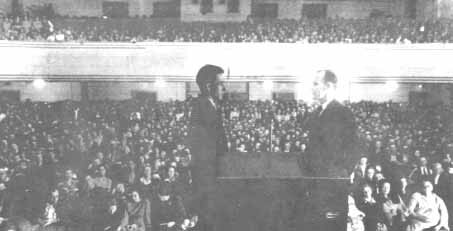 The Preacher, the one Baptising the converts was William M. Branham. The Lord was about to commission His prophet, giving him further insight into his peculiar ministry. As he was about to Baptize the seventeenth convert he heard "a Voice" saying , "Look Up!" Looking up, Wiliam Branham saw a strange Light, like a star, whirling down toward him, coming to a stop just above him. The witnesses standing on the bank of the River were over-whelmed by this unexplainable phenomenon. Some ran for fear; others fell to their knees and worshipped. Many pondered the meaning of this remarkable occurrence. "As John the Baptist was sent to forerun the First Coming of the Lord Jesus Christ, so are you sent to forerun His Second Coming..."
If people can believe that God revealed Himself to Moses, and Israel, and Paul in a Pillar of Fire, WHAT HINDERS THEM FROM HAVING FAITH to believe that God could, and did, do it again in the Twentieth Century? 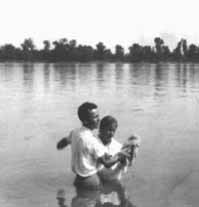 YET even among those who were used of God (through the gift of tongues and interpretation) to "Confirm the Message" given to William Branham on the Ohio River, there are many among them who will now deny what they spoke under the anointing, and deny that Brother Branham was the forerunner of the Second Coming of the Lord Jesus Christ. The answer lies in	Revelation 3:14-22. The churches (people) in this Age fail to recognize their true spiritual condition; And blinded by the traditons of of man-made churches and religious programs, they understand so little about God, His Pattern, and His Prophets. Paul, considering 'the blindness' of the people in his day said, "But if our Gospel be hidden, it is hidden to them that are lost" (2nd. Cor. 4:3). It is a sad scenario BUT it is stark reality. This incident of the Pillar of Fire appearing publicly, which took place on the Ohio River in 1933 also found it's way into a Canadian Newspaper with the heading of "Mysterious Light Appears Over Baptist Preacher". God didn't do these things in a corner. He didn't just commune with His Servant in secret - He Publicly showed Himself before the people. William Branham had only been on the national and international scene for about four years when God came on the scene again to Vindicate His Servant. This time He would allow science, through the eye of a camera to catch It on film. It was January 1950. The place was the Sam Houston Colesium in Houston, Texas. The Circumstances surrounding this "Public Appearance" of the Pillar of Fire was a "Challenge for A Public Debate" over the issue of "Divine Healing Through The Atonement". During a 'Branham Campaign' in Houston this challenge was issued by a certain denominational preacher who opposed the teaching on Divine healing in the Atonement. Rev. F.F. Bosworth, after consulting with Bro. Branham, accepted the challenge, and the whole matter was given front page publicity in the Houston Newspapers. Headlines advertising the "debate" stated, "Eccleasiastical Fur Will Fly". On the evening appointed as the meeting got under way, it was quite apparent that the sympathy of the vast audience was almost entirely on the side of the Bro. Bosworth and Bro. Branham. 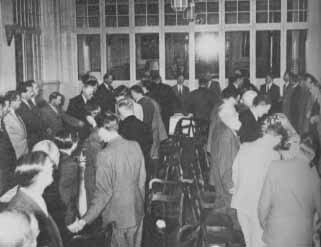 Large numbers of people who were of the same denomination as the opposing minister, stood to their feet to testify that they believed in Divine Healing and had in fact been healed. To record this event on film, the opposing clergyman had secured the services of Mr. James Ayers and Mr. Ted Kipperman, professional photographers who were to take a series of pictures of him while he was speaking. Nearing the end of the debate, the opposing clergy began making calls for the "Divine healer" to come forward. Brother Bosworth acknowledged that Brother Branham was in the building but didn't know if he would come forward. Brother Branham was sitting in the balcony with his wife and brother. His brother had cautioned him not to move. BUT THEN, something happened - Brother Branham quickly stood to his feet. His brother tried to get him to sit down BUT his wife KNEW that something supernatural was moving her husband. She motioned to her brother-in-law that it was alright. Brother Branham later stated that as he sat there, he heard that sound again - like a 'whistling, rushing wind'. A voice spoke and said, "Stand on your feet!" He stood, and obeying the Voice, he made his way to the platform. As he began to move down the isles, the people began to reach out, just to touch his clothes. It was a moving sight indeed and people were reminded again of Bible Days when the people thronged around the Prophet of Galilee, just to touch Him. Moving to the pulpit, Brother Branham spoke quietly, appologizing for the confusion which had been stirred up because of his ministry in Houston. He spoke only briefly - It was cut short when the Supernatural moved on the scene again. Standing behind the podium, Brother Branham heard "that whistling wind-like sound" come down into the building again. With these words, "The Lord has spoken, I'll say no more", he turned and walked off the platform, exiting through a back door. Just before he turned to leave the platform, one of the photographers took "One" picture of Brother Branham. When Mr. Ayers, one of the photographers, went that same night to the darkroom of his studio, he decided to develop the negatives that had been exposed. To his surprise "every one" of the negatives turned out to be "absolutely blank" with the "exception" of the "one" which had been taken of Brother Branham. His surprise turned to amazement when he noticed that on this negative, immediately over the head of William Branham, was apparently a supernatural halo of Light. When informed about the picture, Brother Branham stated that he was not greatly surprised. A number of times previous, similar things had happened in his ministry. In Camden, Arkansas, a photographer had taken a picture of him when he was praying for the sick. When the filmed was developed it was found that a strange Light encircled his head. In the photo at left a halo of light encicles Bro. Branham's head. To verify what Brother Branham already knew was genuine, Rev. Gordon Lindsay, after consulting with Brother Branham, submitted the negative to Mr. George J. Lacy, Examiner of Questioned Documents for the FBI. He was considered the greatest authority on questioned documents in the area. The results of extensive testing is recorded in his "Report and Opinion" link. Once again God had shown Himself 'alive' to an unbelieving Twentieth Century Church. Some believed while others doubted. But there would be more to come. During the next fifteen years of Brother Branham's ministry, God would again SHOW HIMSELF to the natural eyes of man and the scientific eye of the camera. Over the years many Believers have reported seeing the "Pillar of Fire" over Brother Branham as he prayed for the sick. Others have reported seeing other phenomenon. To witness again the appearing of the "Pillar of Fire" we go to Lausanne, Switzerland. The year was 1955 and Brother Branham was addressing a group of Ministers of the Gospel. During the course of his message a photographer took a number of pictures. 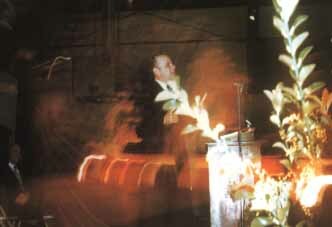 Four of the pictures (below) show the "Pillar of Fire" descending until it stops directly behind Brother Branham's head. 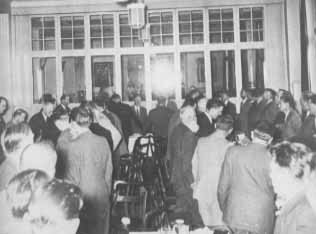 In 1957, God again set the stage for a photograph of His Supernatural Light at the Lakeport, Calfornia, Fairground. 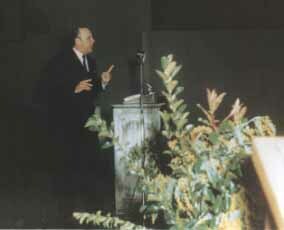 A photographer with excellent equipment took two color shots of Brother Branham while he was preaching. The first picture was normal as shown at left. BUT the other photo was quite different in it's appearance - a definite manifestation of the supernatural. The second picture, from the same location, also contained the details seen in the first, but it was not a normal picture. This picture contains much additional detail that was not seen by those present. Behind Brother Branham, and looking down over him is a perfect profile of a face that can only be described as that of Jesus Christ. A supernatural altar and the seven licks of fire which are spoken of in Revelation as the "seven Spirits of God" which are "before the throne" are also present in the picture. The lilies which appeared normal in the first picture, now, seem to have grown to a large size; they now extend above Brother Branham's head in the picture (Christ, the Lily of the valley). The Angel of the Lord is also seen in the picture with a train of fire proceeding from Him. This "train of fire" seems to envelop Brother Branham. The Angel has licks of fire protruding from His fingertips. A Careful examination reveals that the Angel resembles Brother Branham. (Later, when the constellation of seven Angels appeared in 1963, Brother Branham commented that the Angel on the lower left of the 'cloud picture' was the one that always appeared to him, for he seemed to recognize this one. Not so unusual when you consider that these seven messengers, seven spirits, seven stars, being the seven chhurch age messengers would naturally resemble the men to whom each was sent.) In Ezekiel 1:26-28 we find an exact description of what we see in the second picture - "The appearance of fire from his loins downward and the appearance of fire from his loins upward, even as the appearance of the bow that is in the cloud in the day of rain - the likeness of the glory of the Lord." A tremenduous vindication by God of His servant and Prophet. In this generation, we don't have to merely take someone's word that they saw it, for God has provided color photographs for us, to bear witness that God is indeed, Light. And it is the same Pillar of fire that was with God's prophet of this generation and his Message as it was with Moses and his message. 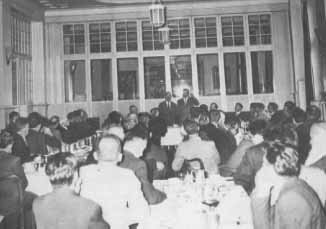 In March 1964, at the rear door of The Soul's Harbor Temple, in Dallas, Texas, the Lord again shows a manifestation His Presence with His servant the prophet. Brother Branham had just completed a series of five meetings and a prayer line. He exited the building through the back door where he was met by a photographer who requested permission to take a picture. 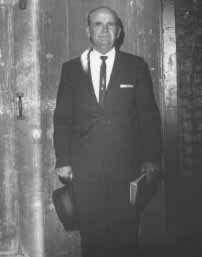 To accomodate the gentleman Brother Branham stood against the door. When this photo was processed a streak of Light was seen on the prophet's right shulder. Later, when shown the photo Brother Branham said, "Put it on the shelf - they don't believe the others and neither will they believe this one." Not the last or the least manifestation of the supernatural, vindicating the ministry of William Branham, was in 1961, in Branham Tabernacle. When Brother Branham had concluded his series on The Seven Church Ages, the "Pillar of Fire" came into the Tabernacle and drew a picture of the "Seven Church Ages" on the wall, exactly as His prophet had it drawn on the blackboard. There were about 300 Saints in the Tabernacle at the time, to witness this event. God did not vindicate His servant in a corner or in the secret place - it was before witnesses. This page does not even scratch the surface of the supernatural manifested in Willam Branham's Life and Ministry. PLUS many other events, vindicating that William Branham was commissioned by God to call a backslidden church world to repentance. But only the 'few' predestinated, Elected Seed of God will believe. For the others - "though one rose from the dead, they will not believe." Copies of the pictures mentioned in this page may be obtained from The Voice Of God Recordings in Jeffersonville, Indiana; or Believers International in Elizabethton, Tennessee.